The HF 400 2Z is a SPDT precision crafted DC ... 2.5 GHz. 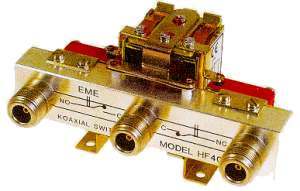 high power relay that has been milled out of solid brass and then silver plated for low insertion loss. 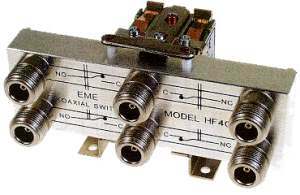 Two separate SPDT sets of external switching contacts are available on this relay to control other equipment such as linear amplifiers or preamplifiers. Impedance ... 50 ohms, Connectors ... N female, Operating voltage/current ... 13.8 0.35A, Switching time ... 20 milliseconds, Transferable Power ... 2000W @ 100MHz. ... 400W @ 2.5GHz. The HF 402 2Z is a DPDT version of the HF 400 2Z. All other specifications are the same. The HF 2006 is a SPDT precision crafted DC ... 6.0GHz. RF relay with an additional set of positive feedback contacts which can be used to control other equipment or indicate relay position. 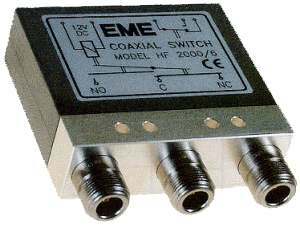 Impedance ... 50 ohms, Connectors ... N female, Operating voltage/current ... 13.8 0.35A (24/28VDC Options), Switching time ... 20 milliseconds, Transferable Power ... 2000W @ 100MHz. ... 400W @ 6.0GHz. 105.0 dB 95.0 dB 87.0 dB 83.0 dB 78.0 dB 75.0 dB 75.0 dB.